working efficiency: 12-18 sets /min. We offer a wide range of packaging machines, strip packaging machines and packaging materials, which are used for packing drugs and health care products These superior quality pharmaceutical packaging machines, blister packaging machines and various packaging materials are offered in several models/specifications . Besides this, we also provide customized product development. 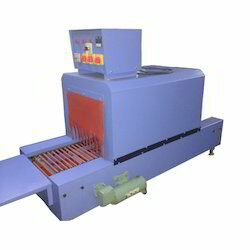 We offer the best quality of Heat Shrink Packaging Machine to our client. Sealing Area: W-42 x L-55 cm 16" x 22"